and Central Europe Time Zone (CET). The Calendars reflect USA Daylight Savings Time or European Summer Time when observed. 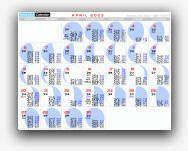 The entire calendar grid is viewable at 800x600 screen resolution. or selecting menu items View>>Full Screen. in the View >> Toolbar section, and uncheck View>>Status and View>>Explorer Bar. In Netscape Navigator, uncheck all items under the View>>Show menu.